Earlier today at the Mobile World Congress 2011 conference in Barcelona, Samsung announced the second-generation Galaxy S II smart phone and a brand new 10 inch Galaxy Tab. These devices run on the latest versions of Android and take a stand against the offerings that came from competitors at CES 2011. Unfortunately, availability and pricing was not announced, however consumers can expect variations to trickle into the United States in a matter of time. Last year’s Galaxy S series made it to various carriers in the form of the Epic 4G on Sprint, Vibrant on T-Mobile, Fascinate on Verizon Wireless, and the Captivate on AT&T. Although some variations from the product line such as the Nexus S made a debut recently, Samsung is back on track with the next-generation Galaxy S II lineup. In addition to stealing the spotlight for the “world’s thinnest smart phone” at just 8.49 mm thin, the new phone also sports a dual-core 1 GHz processor and runs on the latest Android 2.3 Gingerbread operating system. 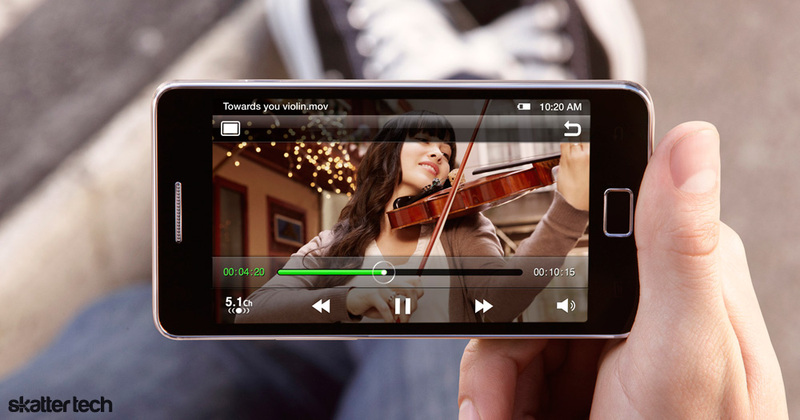 For connectivity, the Galaxy S II features HSPA+ networks, Bluetooth v3.0, WiFi 802.11 a/b/g/n, a USB port, and DLNA media sharing. Like most new Samsung smart phones, this device also sports a Super AMOLED based 4.27 inch 480×800 pixel display. A 2 megapixel front-facing camera for video calls complements the 8 megapixel rear-facing camera with flash for 1080p video recordings. Samsung bundles social networking, reading, gaming, and music hubs for easy access to a variety of content. Other great features include a panorama mode, DivX video playback, a 3.5 mm headphone jack, a FM Radio, voice-to-text capabilities, and GPS navigation. The Galaxy S II even packs an accelerometer, ambient light, digital compass, and proximity sensors with gyroscope to top it off. An integrated Near Field Communication (NFC) chip enables the emerging mobile payment technology. Business users can now enjoy data encryption, secure VPN connections, lost phone tracking, Microsoft Exchange, Cisco WebEx, and Mobile Hotspot WiFi sharing. Samsung will offer 16 GB and 32 GB versions with additional support for microSD expansion up to 32 GB. Aside from that, the Galaxy S II weights just 116 grams and features a powerful 1650 mAh battery. And here are the dimensions for those wondering: 125.3 x 66.1 x 8.49mm. 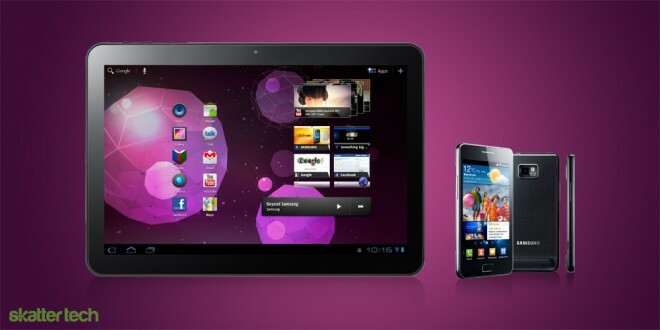 Although last year’s 7 inch Galaxy Tab sold nearly a million units, it ran on an old version of Android. The upcoming 10.1 inch model runs on the tablet-optimized Android v3.0 Honeycomb without any custom TouchWiz additions. Although the initial launch partner is Vodafone, Samsung will likely also partner with American cellular carriers for a future domestic launch. The large display features a 1280 by 800 pixel resolution, a 8 megapixel rear-facing camera with auto focus for 1080p HD recording, and a 2 megapixel front-facing camera for video chat. The new tabbed browser fully supports Adobe Flash content and HTML5 video as well. 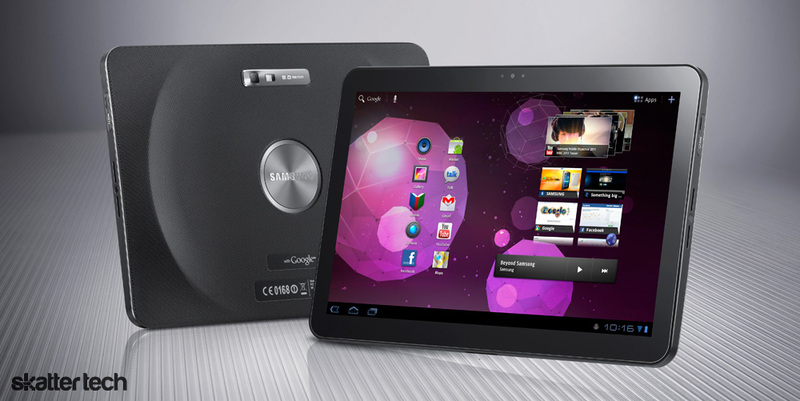 Like smaller Galaxy S II smart phone sibling, the tablet runs on a dual-core 1 GHz processor. An overly large 6860 mAh battery pack keeps it running for long hours while weighing just 599 grams and remaining just 10.9 mm thick. The new Galaxy Tab supports the high-speed HSPA+ 21 Mbps mobile networks, Bluetooth v2.1, and WiFi 802.11 a/b/g/n connections. It can playback most poplar audio and video formats, has a 3.5 mm headphone jack, all the standard Google Apps, and access to the Android Marketplace. An accelerometer, digital compass, and proximity sensor are inside. Samsung will ship 16 GB and 32 GB models, but there unfortunately no mention of storage expansion.